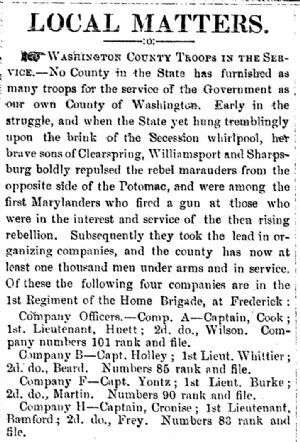 Dec 18 1861- Wash Co troops, Skirmish at Dam 5. Company B—Capt. Holley ; 1st Lieut. Whittier; 2d. do., Beard. Numbers 85 rank and file. Company P—Capt. Yontz; 1st Lieut. Burke ; 2d. do., Martin. Numbers 90 rank and file. Company H—Captain, Cronise ; 1st Lieutenant, Bamford; 2d. do., Frey. Numbers 83 rank and file. Besides these, Captain Fiery’s Company of Cavalry is attached to the 2d Regiment of the Home Brigade at Cumberland ; Capt. Russell's to Lamon's Brigade at Williamsport; Captains Kennedy and Karnes' Infantry Companies to the same Brigade, and Capt. Welsh's Company of Infantry, raised in this town, and numbering some eighty men, to the 4th Regiment of the Home Brigade, while there are at least eighty or a hundred men from the county in the various Pennsylvania Regiments, who entered the service before measures were taken here for the organization of Companies. If there is a county in the State which can exhibit a better fighting or voting record than Washington, we would like to see it. It has been pretty certainly ascertained from persons on the Virginia side of the river that in the late skirmish at Dam No. 5, although there were but a few men firing from this side, the rebels suffered severely, sustaining a loss of five killed and nine wounded, They also left behind them a cannon and about seventy dollars worth of axes, shovels, picks, crow-bars, and other implements with which they intended to destroy the dam, and which, with the exception of the cannon, were brought over the river on Monday by persons who ventured across for the purpose. About four hundred shot and shell were fired by the rebels, and it is now believed that the Dam has been so weakened by their depredations upon it as to be incapable, unless at once repaired, of withstanding any unusual rise in the river. A few dollars expended upon it now might obviate the necessity of spending a great many thousand next spring. On Wednesday, Capt. Russell, with his Cavalry crossed the river at the Dam, and scoured the country on the opposite side from that point to Williamsport, but did not meet any of the enemy's marauders.